Thanks to Tesco, we can now all join Del Trotter and pronounce them as "horse devours" and still sound correct. 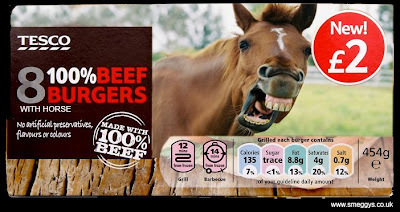 Such quips are typical of the British and international response to startling revelations that retail monolith Tesco has been selling "100% British Beef Burgers" that actually contain 30% horse meat. Several days later, the wit, the puns, the jokes continue to flow in an astonishing demonstration of creativity. This may be because the horse has been a part of British culture for so long, a sufficient chunk of English contains enough horse references to keep the jokes coming. A Muslim preacher once bragged to me that Arabic has over 300 words to describe horse, so you can imagine how much fun they are having in the Middle East and North Africa. As a vegan, I cannot really understand why people are outraged that they have been fed horse meat. They seem to eat everything else, so why get worked up about horse? The tests did not find just horse in the burgers tested, but also an average similar quantity of pig. But it is the horse meat that is getting all the attention. Tesco has clearly flaunted EU food labelling laws. British consumers may have noticed, for example, that certain "fruit juices" are now sold as "fruit juice drinks", because they are not entirely made of fruit juice. A famous example of the apparent absurdity of these new laws was that of Black Mountains Smokery's "Welsh Dragon Sausages". Black Mountains was warned that unless the sausages actually contained dragon meat, they were to cease marketing them as such. "The public analyst has stated that the name Welsh Dragon Sausage is not sufficiently precise to inform a purchaser of the true nature of the food." the warning read. The Daily Mail carried a cartoon in which a witch, carrying an opened box of "Children's Party Cakes", enters a bakery looking very upset. The caption reads, "But there are no children in these cakes!" The funny side and the legal aspect of the horse meat scandal have taken up much of the public's attention. A friend of mine on facebook noted how this story has taken away attention from more serious events around the world. It has certainly taken away attention from Tesco's equally unethical but less amusing practices. Tesco is one of the companies participating in a new government scheme through the Department for Work and Pensions in which Job Seekers Allowance claimants are asked to work for 30 hours a week for no pay or have their benefits withdrawn. Other retail chains, such as Sainsbury's have withdrawn from the scheme, but Tesco it seems is quite happy with free labour. 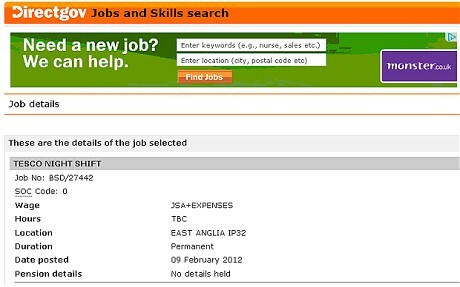 At least 24000 people have been forced in to these work schemes on pain of having their benefits cut. The official excuse is that these schemes offer work experience. Really? 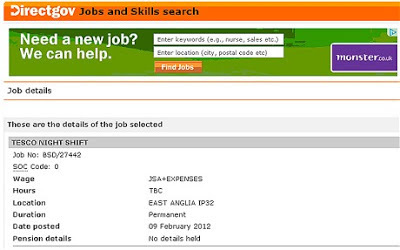 Working at Tesco is work experience for a university graduate? How can they get away with this, someone says. I'd be inclined to agree with the commentator who said, "...it is looking more and more like this workfare program is driven by populist anger against ‘benefit scroungers’: The logic seems to be that if they can work, they should work; and if there are no jobs available, they should work for free until there are. It is policy by demonisation, and it is shameful." What is more shameful is that we are all too busy laughing at the horses to confront this. and there never will be any paying jobs if everyone is working for free! Exactly. In fact, one participant at such a scheme asked the manager, at the end of his stint, if he could apply for what was clearly a vacancy. The manger asked why he should ever pay anyone a wage if he can get them for free.